Sublime, buttery, cheesy and over-the-top delicious. 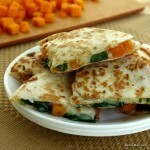 We’re talking about Butternut Squash and Spinach Quesadillas. I switched out the kale for spinach and left off the chili powder (otherwise, I would have to eat ALL of the quesadillas at our house.) So, I can’t speak to the deliciousness of the original recipe, although I’m sure it is awesome. But, these buttery fried tortillas filled with sauteed butternut squash, spinach and mozzarella cheese (or a vegan substitute for my darling daughter) are divine. I absolutely adore the Pioneer Woman’s step by step commentary. But, I do have a few tips to add to for my version that may make the preparation of this sensational squash dish a little easier…and less messy. The longest part of this process is peeling and dicing the squash. 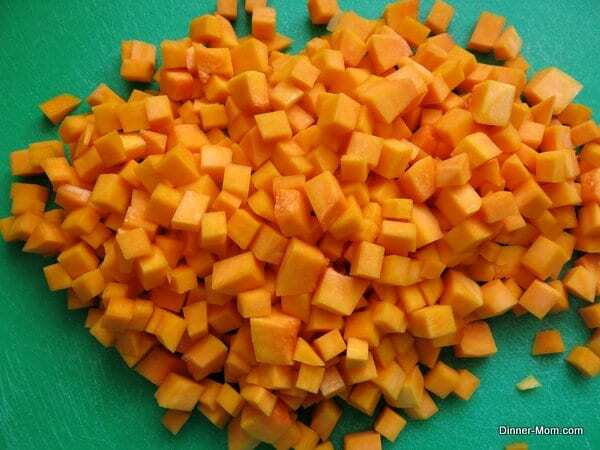 It will take a few extra cuts of the knife, but I highly recommend cutting the squash in cubes that are smaller than 1 inch, like a half inch. The smaller the cubes, the quicker they cook and the final product is less bulky. A lot less of the filling falls out when the cubes are small too. Ergo…less mess. Note that you can peel and dice the squash up to 2 days ahead of time. Saute the diced butternut squash, about 4 cups, in 1 Tablespoon of olive oil and a teaspoon of butter over medium-high heat. The squash is done when it is “just about” fork tender. (Start checking the squash at about 5-7 minutes.) By the way, “just about” is my technical term to indicate that you still want the squash to be a little firm because it’s going to cook a little longer when you add the spinach. When the squash is just about done, add the spinach. By the way, I love how raw baby spinach overwhelms the pan when you add it and then in a blink of the eye (or about 2-3 minutes later,) the spinach wilts down and is perfectly proportioned to the squash. To assemble the butternut squash and spinach quesadillas, butter one side of a flour tortilla and lay the butter side down in a hot pan. 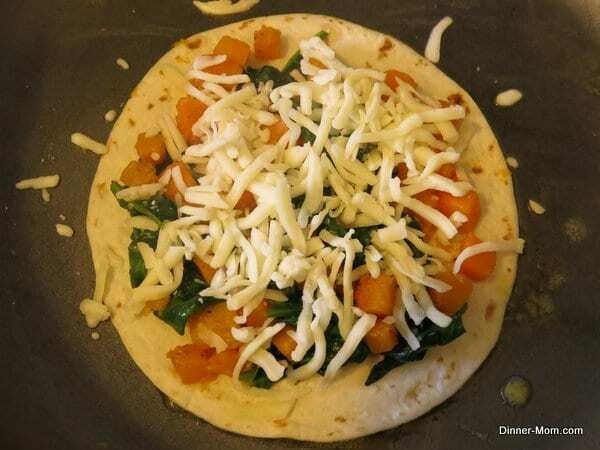 Top the tortilla with about 1/2 cup of butternut squash and spinach and then sprinkle about 1/4 cup of shredded mozzarella cheese (or vegan substitute) over the top. Butter a second flour tortilla and plop it on top. When the cheese begins to melt and the bottom is just a little toasty, flip the quesadilla over and toast the other side. Also, by using smaller tortillas, everyone will get two. And two is always better than one. Right? I made 8 small quesadillas in total. Remove the quesadillas to a plate and cut them into triangles with a pizza cutter. Enjoy! 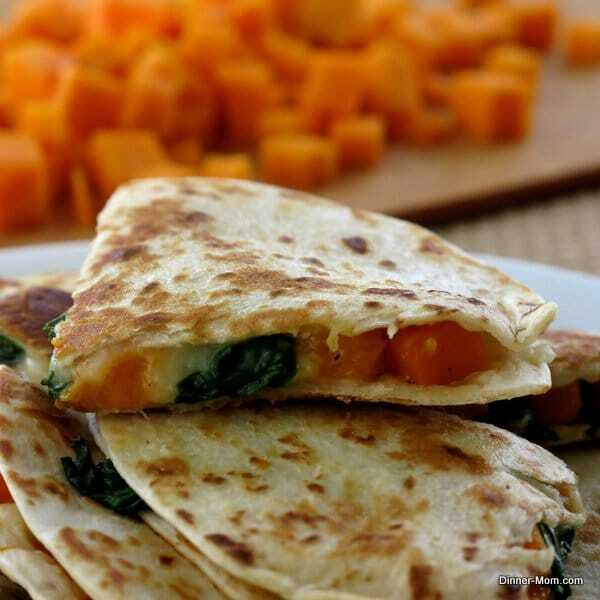 Butternut squash and spinach quesadillas are a sublime treat, except that they're not a dessert at all but rather a delicious meatless meal or appetizer. Heat olive oil and 1 teaspoon of butter over medium-high heat. Add spinach leaves and saute for about 3 minutes more or until spinach has wilted. Remove from heat. Butter one side of the tortilla and place it butter-side down in a clean pan that has been heated over medium heat. 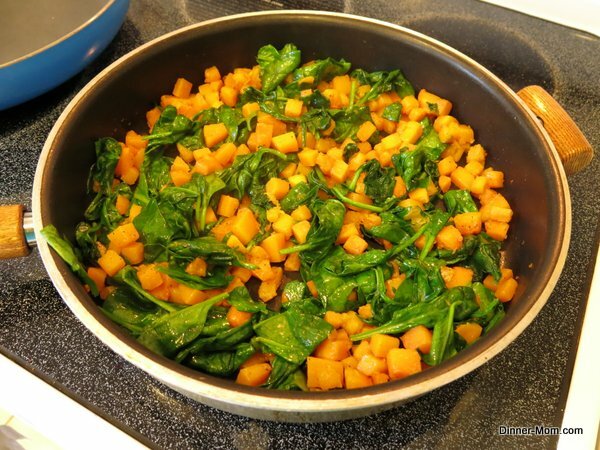 Spread about 1/2 cup of butternut squash and spinach mixture over the tortilla. Sprinkle about 1/4 cup of cheese over the top of the squash and spinach. Butter one side of a second tortilla and place it, butter-side up on top of the cheese. When the bottom layer is toasty and the cheese has begun to melt (about 1-2 minutes), flip the tortilla over and toast the other side. Remove from pan and repeat process to make the rest of the quesadillas. Cut quesadillas into triangles using a pizza cutter. Yes, two is better than one however I’ll take three of these tasty quesadillas. 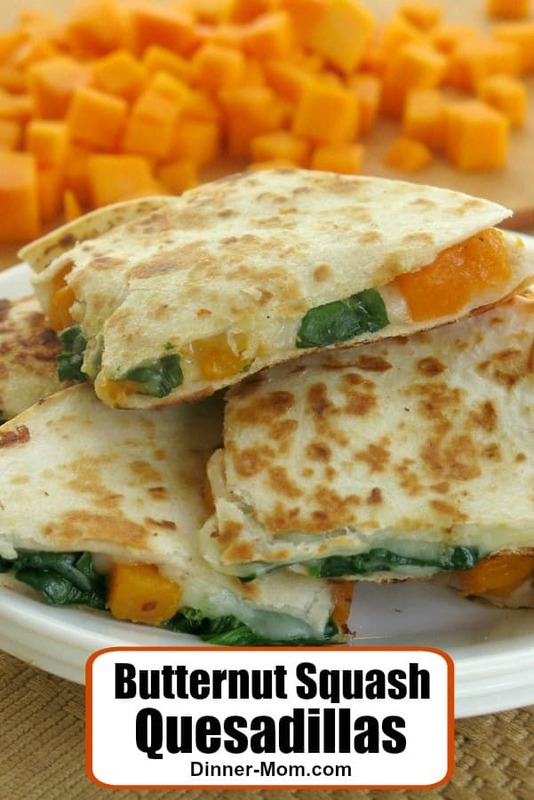 I make roasted squash and spinach soup a lot, so I can only imagine how awesome these quesadillas are! Tortillas make everything better. And your ‘just about’ describes it perfectly! Your quesadilla looks amazing! I think I’ll make a big batch of butternut squash and have this for this week for dinner! I just love it! Oh my gosh, I love quesadillas. I love how filling these probably are, compared to just a cheese quesadilla (which I make a lot). I know Publix carries the pre cooked and peeled diced butternut squash, but sometimes I have a hard time finding it. That would be perfect to make this a quick dinner. Need to look for some today. I think even the pickiest eaters would eat this! Thanks for the great recipe. Lunch! I can see this with any number of green vegetables. Whoa, I love how thick and packed full of goodness your quesadillas are! They look sensational! What a fantastic idea to put squash in a quesadilla, brilliant!! 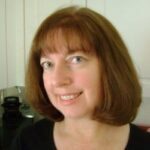 Love the Pioneer woman. Your quesadillas are gorgeous, love the pictures!! i’m looking for more creative ways to eat vegetables. this sounds great! I could kill for this! This is brilliant, delicious vegetarian dish. I was just thinking the other day about quesadillas and how suddenly they appeared on the food scene many years ago. And now they are everywhere with all kinds of fabulous fillings. I love yours with butternut squash and spinach, Marjory! This is brilliant! My 3 year old would love it. You found my savory weakness: spinach and mozz in a crispy tortilla. Plus butternut squash? I’m sold. I love this recipe! 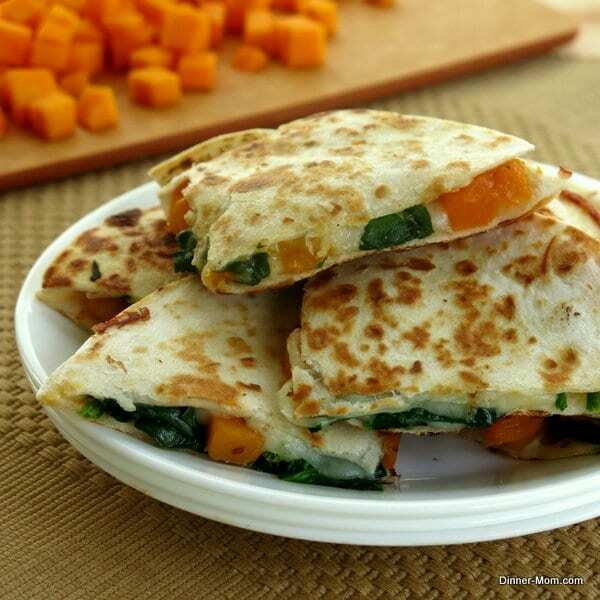 Butternut squash and spinach sound amazing in a quesadilla. I’m going to have to try these soon! My favorite green and favorite squash and ooey gooey mozz cheese…Love!!!! Yummm! I have made butternut and spinach enchiladas before, but I think I could really go for the quesadilla version like you have! They look like crispy yet gooey perfection. Very different for a quesadilla. I do like the squash spinach combo too! Delicious! I made these last night for dinner! Thanks for sharing! I’m so glad you liked them. I’m going to have them again this week. Thank you to all my #SundaySupper friends for stopping by during this awewsome squashin’ event! I hate peeling the butternut squash, but it was totally worth it! These were yummy!